Why is important to teach kids about responsive worship? Young children love to sing, clap, and dance. Each time we lead kids in worship, we instinctively call them to worship responsively: “Clap your hands! Sing out! Shout Hallelujah!” One of the dangers inherent in teaching kids to worship this way is that we sometimes call for responses without showing kids a clear picture of the Heavenly Father they are responding to. With Clap Your Hands, Stomp Your Feet, our goal is to help kids respond to the grace and goodness God has spoken in his Word. 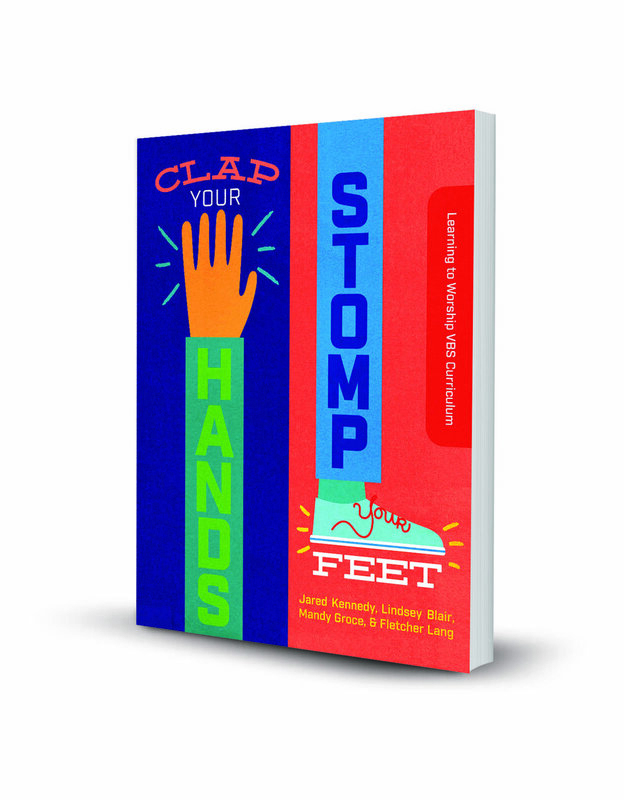 Appropriate for use with churched and unchurched children alike, Clap Your Hands Stomp Your Feet teaches that proactive praise is a lifelong response to the good news of Jesus. Each day connects the truths of the gospel to real-life scenarios through a study of the life of King David, and is written with a heart to call children to contagious, demonstrative praise. What inspired you to teach responsive worship through the story of David’s life? Fletcher Lang and I used to share a small office at Sojourn Community Church in Louisville. Some of my fondest memories in ministry took place in that one-window room. Fletcher and I would have these curriculum brainstorming sessions where we'd fill up a little white board that hung on the wall at the far end of the office with crazy ideas. This one began with an idea to teach responsive worship using the game Simon Says - God speaks and we respond! I suggested having a Psalm for each day and Fletcher brilliantly suggested using narratives from David's life. Is Vacation Bible School still an effective means of reaching un-churched families? Yes. A one-week VBS provides a great opportunity for Christian kids and parents to invite their un-churched friends and neighbors. The un-churched family might see the event simply as a way to get free childcare or as a chance for their child to grow socially. But the child who attends a full week of VBS encounters more intentional Bible teaching than he or she would receive in nearly five months of regular attendance at Sunday School. A well-organized, engaging VBS is a great way to help your church's reputation with un-churched parents as well. Just imagine the kinds of conversations these parents will have when their children come home after a full morning or evening of engaging the Bible and church community. Are there other ways to use the curriculum other than in a week-long VBS? Of course. You could also use the curriculum for a backyard club or for a short-term midweek curriculum taught over the course of five weeks. In addition, a number of our Sojourn congregations in Louisville have shortened the teaching to three or five day programs then finished out the curriculum on the following Sunday. This model both provides an opportunity to celebrate the children who have come to VBS with the entire congregation and gives a clear invite for un-churched families to take a next step toward faith by gathering with the church community. What makes your VBS curriculum unique? I think the most unique thing about our curriculum is that the originators and authors are local church leaders. Most VBS curriculums are designed by large publishing houses, and we're certainly indebted to New Growth Press and the work their team has done to make this curriculum available to the larger church community. But we also like to say that our curriculum sets are "by the church and for the church." Our VBS team primarily combines the talents of a local church writing guild that includes moms and dads, local church pastors and Sunday school teachers—all who love kids and want to share God’s good news with them! What is your favorite activity in the curriculum? I loved making the craft instruments every day. The kids will bring them to worship during the closing assembly and "make a joyful noise." Teaching the to use what they've made to honor God in worship is really fun to me. Also, the giant slingshots in recreation on the day we teach the David and Goliath story are a blast too. I could hang out in that area all day! The Clap Your Hands, Stomp Your Feet: Make a Joyful Noise VBS starter kit includes a director’s guide, games guide, craft and assembly guide, printables, and much more. It even includes a studio-recorded children’s worship CD and digital songbook produced by Sojourn Music. Purchase now from New Growth Press.